This post is a part of my ‘Makeup Basics’ series. In these posts I go over the basic makeup steps for beginners. I’m gonna teach you how to choose the right products and how to use them. You will learn some essential things of makeup and get some tips. Today we’re talking about primers. Primer’s primary function is to set the makeup and hold it in place the whole day. Primer makes a smooth, even layer on the skin and makes a great base for foundation. But how to choose the right primer for your skin? When you choose a primer you should ask yourself what is the main problem with your skin. Is it..
..dryness? Choose a hydrating and illuminating primer. .. redness or uneven coloring? Choose a primer that evens out the skintone. .. oiliness? Choose a primer, that promises a matte finish and good stability. .. the changes brought by age? Choose a primer that smoothes lines and wrinkles. If your skin is in a good shape, you don’t have to use a primer daily. You may still want to get one for special occasions such as parties. Primer helps to keep the makeup in place longer, so you should consider that. My skin is mixed, so it’s oily, but sometimes dry. I usually go for primers, that smooth out my pores and make my skin matte. I have tried a bunch of primers and now I’m sharing some, that I’ve tried and liked. I have to note, that in some cases a day cream can act as a primer. At the moment youtubers and makeup artists love the Nivea After Shave Balm, which keeps makeup in place the whole day. That is at least a very affordable product! This smoothes wrinkles, lines and pores. This has a nice satin feel to it. It is suitable for all skintypes. Nice product, and I’ve already used half of it. This promises to really smooth pores and keep the makeup in place. The consistency is a thick paste. I love this, but it doesn’t last as long as I would like – I start to shine sooner than I should. This moisturises and treats the skin, while helping with longevity. I like the texture and the fact that this doesn’t clog my pores with silicones. It makes a nice base for applying makeup for all skintypes. It’s also organic and vegan. This hides redness like no other! Good stuff, seriously. This basically feels the same as the foundation primer, except it has a green/mint pigment in it. This is also organic and vegan. My favourite primer of all times! This beats all the other primers. I bought this for brides or special occasion makeup, but have been using this daily. This illuminates and brightens the skin, but also minimizes shine and keeps the makeup on point the whole day. This is amazing. An example of what a primer can do. 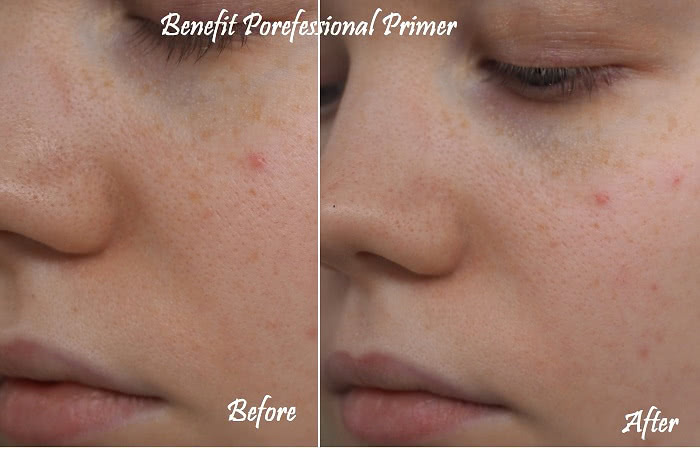 See how Benefit Porefessional primer hides my pores and makes my skin smooth and quite matte?